Go to Manager/Setup > Hotel Control Files Setup > Room Types. Select #1 Room Type Set-up to create a new room type. "Room Type" is the alphanumeric code for this room type and must be four or fewer characters. The code commonly uses meaningful characters such as KJKC for King with Jetted Tub and Kitchen facing Courtyard or 1BED for one bedroom unit. When you set up new rooms, you will see a message, "GARMAST.FIL Record not found." That means this is a new record. Just press Enter or click OK. Each room must have a valid room type. Note: If you are using Execu/Tech's Catering and Events software for space or venue booking, you must set up meeting or banquet rooms with room type CONF. You must not use CONF otherwise. "Description" may be up to twenty characters and will print on the registration form and confirmation letter. Examples are "2 Qs w/ microfridge" and "1 BR facing lake". "Rates" should be entered into this grid only if you are not using the Season Record. If you have set up seasons, then use the "Season Rates" button at the bottom of the screen after you have entered the rest of the information for this room type. 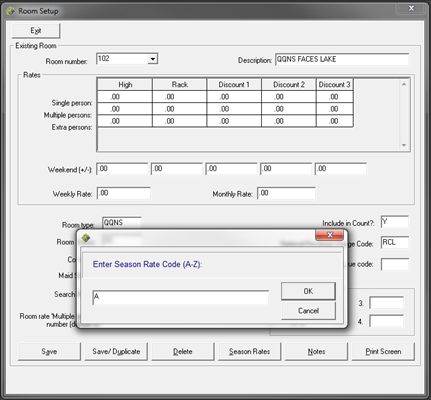 If you have seasons setup, then click the 'Season Rates' button at the bottom of the Room Types Setup screen where you will be prompted to enter a season code. Each season's rates are set up separately. You may have up to five rate codes per season plus comp and corporate rates. The default titles for the five rate codes are: "High" (rate code 1), "Rack" (rate code 2), "Discount 1" (rate code 3), "Discount 2" (rate code 4), and "Discount 3" (rate code 5). These titles may be edited in MENUINI.FIL. "Single person" is the rate for one person in the room. "Multiple persons" is the rate for 'multiple persons' as defined below. For example, if 'multiple persons' is defined as 4, then this rate will apply when four or fewer persons are in the room. If 'multiple persons' is defined as 2, then this rate will apply when two or fewer persons are in the room. 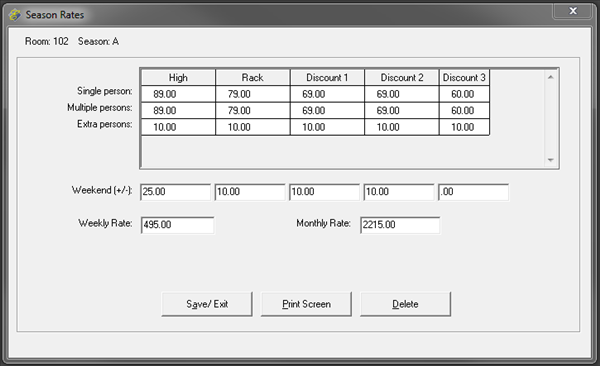 Do not leave this field blank if you are using this rate table. If the rate for 'multiple persons' is the same as the rate for 'single person' then enter the single-person rate for the multiple persons rate. "Extra persons" is the ADDITIONAL rate for each person over the 'multiple persons' setting. For example: if your single person rate is $100. your multiple person rate is $120, your multiple persons setting is 4, and your extra persons rate is $20 then the room rate for five persons is $140. "Weekend (+/-)" is the ADDITIONAL amount that should apply on days defined as weekends in your Season Record . To add twenty dollars to the nightly rate, enter 20. To subtract twenty dollars from the nightly rate, enter -20. To use percentages for weekend rates, edit MENUINI.FIL appropriately. For weekend rates, you must use dollar amounts or percentages; not both. "Weekly Rate" is the amount to charge when the guest's rate code is W. This amount will post once per week on the day designated at check-in. Weekly rates do not take number of guests into consideration. "Monthly Rate" is the amount to charge when the guest's rate code is M. This amount will post once per month on the date (1 through 30) designated at check-in. Monthly rates do not take number of guests into consideration. "Number of Rooms" should match the actual number of rooms of this type in the Rooms setup. If this does not match, your availability will not be accurate. "Central Res'v Code" should be blank unless otherwise instructed by Execu/Tech. "Include in Count?" is set to Y if you wish this room type included in inventory. If you are setting up boat slips or RV spaces that require water and electricity meter readings for posting purposes, enter U in the field. "Default Market Segment" sets the default market segment for this room type if you enter a valid market segment code . This field rarely is used. "Default Source of Business" sets the default source of business for this room type if you enter a valid source of business code . This field rarely is used. "Comment" may be up to 30 characters and is for storing comments for this room type. It does not print or display anywhere else. You may use 'Notes' to enter information that can display in the Room Types availability screen. The Notes button is at the bottom of the Room Type setup screen. 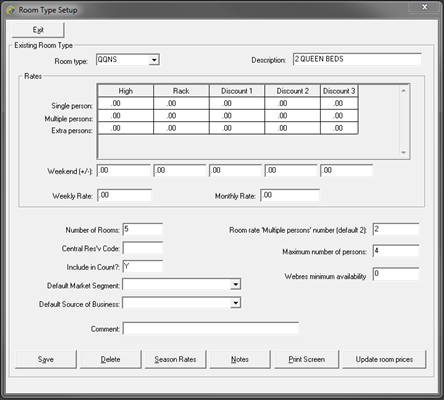 "Room rate 'Multiple persons' number (default 2)" sets the number of persons allowed in a room before the "Extra persons" rate applies. The default is 2, meaning that the Extra person rate will apply to the third and each additional person in the room. If this field is set to 4, then the Extra person rate will apply to the fifth and each additional person. "Maximum number of persons" sets the maximum number of persons allowed for this room type. For example, if this room type accommodates no more than four persons, then you would enter 4 in this field. You may leave the field blank if you do not want to restrict this. "Webres minimum availability" is reserved for future use. When active, it will be used to set the minimum number of rooms of this type available on WebRes. If you are using the Season Record , click the "Season Rates" button at the bottom of the screen or press Alt+S. Enter the season code at the prompt as shown below. Enter the rates for each season just as you would in the "Rates" section of this document. When you are finished, click 'Save/ Exit' or press Alt+A to save and exit. Continue in this manner until the rates for each season have been entered. Click 'Update room prices' to update each room of this type with the rates you have set up. If all rooms of this type do NOT have the same rate, then enter the rates in the Rooms setup and not here. The system will update the rates for each room of this type. A pop-up will show the number of rooms updated. This should match the figure that you entered in the 'Number of Rooms' field, as shown below. If these do not match then the actual number of rooms given this room type does not match the figure you have entered for the number of rooms for this room type. When you have finished entering all information and rates for the room type, click 'Save/ Exit' or press Alt+A to save and exit. Press Esc to exit without saving. To enter additional room types, follow the steps above. 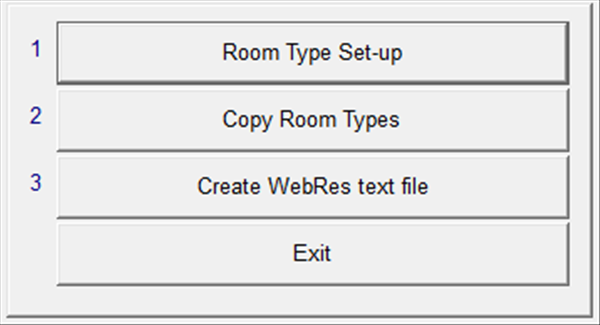 If you have room types that are similar to this room type you can copy them by selecting #2 'Copy Room Types' from the Room Types menu. Enter the room type to copy FROM and the room type to copy TO. All information will copy including seasons and rates. You can then go into the new room type and change things such as 'Description' and 'Number of rooms' as appropriate. The Notes will not copy. However, you can use your mouse to copy the Notes from one room type and then paste them with your mouse into the other room type. If you are using WebRes, select #3 'Create WebRes text file' after speaking with Execu/Tech.